So far we've thought of a load of reasons that a team might want values, and loosely grouped them. That's the Why. Next step: the What. In a second meeting following the same lightly-facilitated format as the first, we asked ourselves what kinds of values might be good fits to each of our four motivational categories: encourage, emphasise, empower, and explain. We were flexible about what constituted a value, accepting philosophies, actions, outcomes, or whatever. We aimed to get the ideas out without too much filtering and, again, we used a mind map to document our balanced, open discussion. A consequence of this is that I can no longer tell why, for instance, we didn't we make openness and transparency a single entry. Maybe there was a good reason, maybe it was oversight, or maybe I transcribed things incorrectly. Regardless, what we had was good enough to move forwards in the moment, and with momentum. Following another period of reflection we gathered again to choose the subset of the values which would become our focus. We had generated 40 or 50 and I judged that a simple discussion would not easily get us to consensus. So I created a spreadsheet listing all of the values and we split into small groups to rank them, expecting that the top-ranked values would encode those that we felt most strongly about, for whatever reason. Interestingly, and painfully for me, each of the groups attacked this task with a unique twist: some provided a strict ranking that represented their combined opinion, some scored individually which meant multiple values could have the same ranking, some simply selected the values they felt were important without any scoring at all, some chose a few values and some chose many, some merged values together and scored the combination, and the merged values were not necessarily the same across groups. The effort in that session was deep and the conversations were sometimes quite intense. We'd hoped to combine the results on the day but, due to the complexities of the varied ranking schemes, we didn't even try. So, instead, we shared all of the results back to each other, with a little commentary from each group, and ended the meeting. For me, ranking at this point was productive but in retrospect I think it could have been easier to have proposed or imposed a more specific ranking scheme. Of course, this might have necessitated a meta conversation around ranking, which itself could have been difficult to resolve. Systemic discrepancies aside, there was real, countable, actionable data generated in those ranking conversations and, to do justice to it, I invested time in looking for ways to aggregate it fairly. In the end I presented several different normalisation strategies back to the team. The simplest merely counted the number of times a value was ranked at all, while more complex attempts scaled everyone's rankings to have a total "score" of 1, with weighting for merged items. I also created a graphic which showed visually which group had ranked which values, and which values had been merged. After agreeing that the analysis was reasonable we decided to take this set of seven values and begin to develop a non-shallow understanding of what we meant by them. The same groups as before each came up with short definitions for a value or two and we debated them together. Lesson learned: nuance is everything. My role here reverted back to light facilitation, recording outcomes, keeping time, and aiming to ensure that all voices had an opportunity to be heard. It was delightful to witness the conversations we had across the weeks. Even if we had eventually failed to arrive at a set of values, the dialogue and the engagement with which we were having it (most of our team attended most of the meetings), felt like a valuable way to share perspectives and build empathy with one another. Risk-driven: Use relevant data to try to identify the important risks, their likelihoods, and their impacts, and deal with them in a reasonable priority order. Strive not to do this work in isolation from others. Recognise that we won't always find all of the risks, and we won't always assess those we do identify correctly. Be alert to the possibility that our analysis can change based on new data. In the next review we agreed that we'd captured reasonably well something that the group as a whole could agree with. Yay! We then tried and failed to reduce the set further. Boo! But pragmatism reigned and we decided that we'd live with the large set for a while before thinking again. Stopping seemed like a good choice to me. Despite the enthusiasm and continued strong level of participation across the team, I was wary of us becoming fatigued with the effort. Now felt like a good time to put the values into use, gauge our comfort with them and then iterate on the basis of experience. 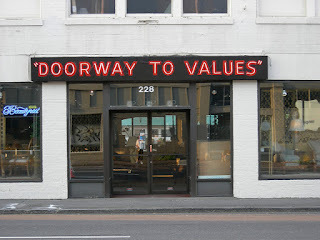 In the next post I'll talk about that experience and how it resulted in us cutting our list down to three core values.